mittee chair Brian J. Sherr. Lehrer and Jo Ann Levy. Laurie Gross, wife Evelyn Gross, daughter Cathy, and son Mark.
? tation, at 10 p.m.
mitted to all things Jewish. Where do Singles Fit In?" of singles to the State of Israel. ple beginning at 10 p.m.
singles in the 30-50 age range. serving the elderly ot South Ftonda lor 43 years. Lauderdale who relates the events of the present and the past. THE STORY TOLD BY SARAH H.
for those of us who wanted to participate, to visit an Israeli home. discussion over coffee and home-baked cake. ing his last years he had served as chief of security at the Knesset. but one story of Sarah's early childhood sticks in my mind. take care of Sarah during the day when her parents were busy. their plea and came out. The Arabs promptly killed him. ultra-orthodox will cause Israel to be torn apart. behavior. At least that is the way Sarah H. finished her story. tions of the Arabs against the Jewish settlers? prime sponsor of the Hate Crimes Statistics Act. meeting at Temple B'nai Torah in Boca Raton recently. cern for the plight of Soviet Jews. agenda of the two superpowers. Soviet Jewry in Washington, D.C.
fessional work after applying to join his father and sister in Israel. home to Moscow, on the trumped-up charge of drug possession. is still serving his sentence. Jewtafc rillHlir Dee. Net OaaraaU* Kaearata ef Merchaaaiec Adv.rtieee. Greater Fort Uuderdale ahould be addreaaed: Jewlah Federation ol Greater Fort Lauderdale, P.O. Bo 28610, Tamarac, FL 333204*10.
our heritage alive, make your donation TODAY! Springs City Commissioner Janet Oppenheimer. MAXWELL HOUSE* Good To The Last Drop"
from any one of over 30 U.S. cities to Tel Aviv. ROUND TRIP TO TEL AVIV, ISRAEL. Pan Am flies lo more places In Europe than all other U.S. airlines combined. 4. Winner will be selected in a random drawing on October 15. 5. Prize consists ol round-trip airfare tor two to Tel Aviv Israel. in these towns in Kfar Saba. childhood center in Kfar Saba. the skills they have learned. those kids in the city schools. Saba '8 Senior Citizens' Center. "This is an ongoing agency,"
new role with great anticipation. So try something new this Summer with Ronzoni"
No pasta shapes up better. Volunteers For Israel Offers Special Summer Program. $621 for those 26 and over. Report JAN. -85; BOX KM* Less than 0.5 mg. "tarT less man 0.05 mg.
tist, is also his aunt. Marcus, Adam Ellis, and Yaniv Offxr. would be "crazy" to vote for Jackson based on his Mideast viewB. YOU'LL HAVETO GIVE UP CHOLESTEROL. with the alternative minimum tax. as the basis for the test. one of the national winners. That he could hardly bear. My life is naught but waste." On my other shoulder." .. . He wanted to get older .. THE CALL OF THE LAND . the American Jew to be found. brethren that they are not alone. ed to the Jezreel Valley. 'Effendi' early in the year 1909.
quarters had to be found for them. was twelve by eighteen in size. our supplies and our fowl." our home for the last three years! new life in the Land of Israel. soon and as often as possible. Meeting and Installation held ^ Esther Lerner. M ^B Play-A-Day for UJA. Levey, Lion of Judah co-chair. or tennis or just relax at the spa." 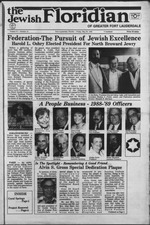 the $100,000 mark for the 1988 Federation/UJA campaign. Activity Center in Trafalgar Square. that will be forming in the near future. activities, contact Ken Kent at the Federation, 748-8400.
hours will resume on Tuesday, May 31.
perfect token of your organization's friendship. With my best wishes to you and your membership. with pure mountain water and nature* sparkling effervescence. gram* listed please call the center. tivities begin to wind down. Imagine water that tastes fresh and clear as a spring. Dinner Dance to be held at the 110 Tower Club, Ft. Lauderdale. sentences for all second time drug offenders. ISRAEL WILL again this year be the major recipient of U.S.
sales, $3.6 billion of which are expected to be offered to Israel. Jerusalem at the end of July. of the Hebrew University on Mt. last month's Negev bus hijacking. with three bombs in his car. will receive a firm U.S. response." Lite Delite with this coupon. 4- Why are "kreplach" eaten? young people that is celebrated? "Festival of the First Fruits." agricultural origins of the festival. himself to live by the Torah." Some of the presenters from left, seated: Evelyn Goliger, N.E. Shapiro, MSW; and Sandra Friedland, Jewish Federation. Day Care Program of the N.E. Evelyn Rabinowitz, Lillie and Sam Sklar. telling of the Fund projects in Israel. May 23 Shavuot. Federation closed. sional Division Happy Hour. 6 p.m.
head of one of the group's terrorist factions was quoted saying. Potato salad tastes as good as it always did. toss to coat well. Cover; chut Makes 5 cups. one of this nation's closest allies. puts American foreign aid to Israel in perspective relative to U.S.
assistance to other countries, illustrating the bargain it is. world economy in the 1970's, and a boycott illegal under U.S.
tion ago, that of a national economic miracle. For People With a Healthy Interest In Eating Well. Kutsher's alternative to the summer sun? for the best vacation imaginable. follow the sun and the stars to Kutsher's. 12 all-weather and clay tennis courts. A fully equipped health club. Lakeside walking trails. Outdoor and indoor pools. Plus much more. in the Soviet Union at that time. to them, generally upon request. d'oeuvres and one free drink. and all the festivities on June 2. Klein at the Federation, 748-8400.
between U.S. and Soviet officials. gle on behalf of Soviet Jews. in seeking a redress of the plight of Soviet Jews. 1) Emigration of all Refuseniks. receive invitations from first-degree relatives abroad. the "State Security" denial of exit visas. form associations with Jews in the USSR and other countries. 6) Provision of direct flights for Jews emigrating to Israel. ticularly with respect to access to institutions of higher learning. and Kol Yisrael radio broadcasts to the Soviet Union. are emerging in the Soviet Union. US A A POllWI'Ol WlJ*iintf. May 7 at Ramat Shalom. vah at Temple Kol Ami. Israel in Sunrise on May 28.
his Bar Mitzvah on May 14. Temple Beth Israel on May 7. Torah in Tamarac on May 14. Club and Ambassador's Society of Trustees. the Board of Development Corporation for Israel. Looking on is William Cohen, left, city director. The union purchased $250,000 in bonds. daily 8 a.m.; Monday Thursday 7:30 p.m.; Sabbath 8 p.m., Sabbath morning8:45 a.m.
TEMPLE BETH ISRAEL (742-4040). 7100 W. Oakland Park Blvd.. Sunrise, 38313. Blvd.. Deerfietd Beach. 3S441. Service*: Sunday through Friday 8:30 a.m 5 p.m.
TEMPLE B'NAl MOSHE (942-6880). 1484 SE 3rd St. Pompano Beach, 33060. Service*: Friday 8 p.m. Cantor Jenadah Heilbraaa. TEMPLE SHA'ARAT TZEDEK 741-0296), 4099 Pine Island Rd.. Sunrise, 33821. Friday service 8 p.m. Saturday 8:45 a.m., 5:80 p.m. Cantor Joel Cohen. HEBREW CONGREGATION OF LAUDERHILL (733-9660). 2048 NW 49th Ave..
Sunday to Friday at 7:46 a.m. Friday at 6 p.m.; Saturday at 8:45 a.m. Charles B.
a.m., Sunday 8 a.m. Rabbi Yoasie Denbarg. Women! Tuesday* 8 p.m. Rabbi Aron Liebrrman. Deerfield Beach. 33441. Services: Sunday through Friday 8 a.m. and sundown. Saturday 8:45 a.m. and sundown. Joseph M. Reiner. President. Sunrise, 38361. Services: Friday 8 p.m. Rabbi Dennie Wald. Cantor Ron Graner. Menorah Chapels. 2305 W. Hillsboro Blvd., DeerfieW Beach. 33441. Friday 8 p.m. Rabbi Nathan H. Fish. Cantor Morris Levineoo. Bat Milzvah. Rabbi Jeffrey Ballon. Cantor Rita Shore. <% 8:15 p.m., Saturday 10:30 a.m. Rabbi Sheldon J. Harr. Cantor Frank<br /> Birnbaam. vice: Weekly on Friday evenings at 8 p.m. RabM Lewis Littaaaa. youth and service to the Temple. to Museum of Fort Lauderdale. a.m. North Lauderdale City Hall. and Dinner. 6 p.m. 583-6100.
mont: Officer Installation. 10 a.m.
sion: Happy Hour. 6 p.m. If you have been thinking of Pre-Arranging a funeral. Broward. Dade and Palm Beach counties"
Low Airfares lb The Vtorid. $48 in Rome, all based on double occupancy. at just $69 with unlimited mileage. Restrictions: Fares are roundtrip in economy with varying advance purchase, effective dates and min/max stay requirements. available on all flights, days, and holiday periods. Fares and schedules subject to change without notice and government approval. Boston not included. HOTEL: varying effective dates, advance reservations/purchase requirements apply. Hotel space is limited. gas. collision waiver, taxes and drop-off charges extra. Car offer not applicable to certain fare types. Number one to Europe. And more.